Two of America’s greatest cities, linked by one of the world’s most scenic roads. Whether you call it Highway 1, Big Sur or the Pacific Coast Highway – the breathtaking drive from San Francisco to Los Angeles is an amazing adventure that is worthy of its reputation. All of our American road trips can be tailored to meet your requirements. Do you have more or less than 10 days for your road trip? No problem, we can bolt on extra nights to allow more time to explore or shorten the number of destinations as required. Just let us know when requesting your quote. Today you'll make your way out of San Francisco to Monterey. Monterey was once California’s capital of the whaling and sardine industry, however, today it's best known for the world-class Monterey Bay Aquarium that presides on Cannery Row. The focus now is on marine education and preservation. Want to experience the bay area first hand? Take a whale watching trip during spring or autumn. In the early evening, cruise along the famous “17-Mile Drive” on your way to Carmel-by-the-Sea. You’ll pass millionaire mansions, Pebble Beach Golf Club and a beautiful rugged coastline along the way. Carmel-by-the-Sea has two world-class beaches backed by a gorgeous small town made up of beautiful homes, restaurants and quaint streets. To the north is the world famous Pebble Beach Golf Course and to the south is Big Sur starting with the wild and wonderful Point Lobos which can be enjoyed through the many short walks. Head south down the iconic Pacific Coast Highway to the southern end of Big Sur. This classic All-American drive is at its most dramatic along this 90 mile stretch of coastal driving. Twisting roads curve around steep cliff faces, passing gorgeous State Parks and spectacular vista points that overlook the vast Pacific Ocean. Hearst Castle, Cambria perches on “The Enchanted Hill” and overlooks the ocean in the distance. This is an extraordinary home that hosted the world’s most famous and wealthy. Today Hearst Castle offers the chance to see fine antiques and art from around the world in an over the top setting. 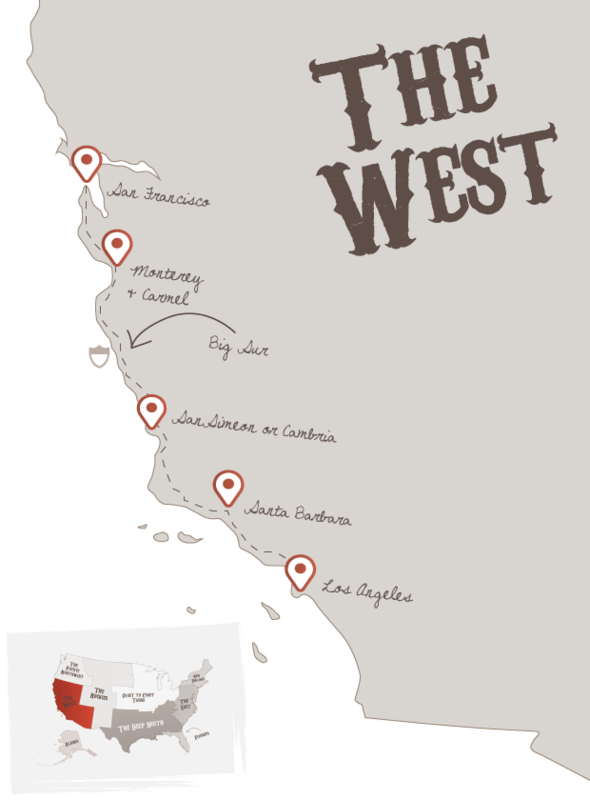 Continue South along Highway 1 and the 101 passing lovely small beach towns such as Morro Bay, San Luis Opisbo, the central coast wine area and Pismo Beach. You'll then reach Santa Barbara which is built in a charming Mediterranean style making it one of the Central Coasts top highlights. Stroll along historic State Street, visit the Santa Barbara Botanic Gardens or simply enjoy the town's beautiful beaches. After breakfast, you’ll continue driving south down the Pacific Coast Highway passing Malibu’s beaches and coastal homes en route to Santa Monica in Los Angeles. Santa Monica with its “Baywatch” beaches and old-fashioned Pier is a worthy finish to the day. Hire a bike and cruise along the boardwalk down to Venice Beach or shop till you drop on 3rd Street Promenade. Tinseltown is synonymous with glitz and glamour, and although many of the studios have now moved on to other parts of the city, it's still fun to visit the home of the Oscars and walk Hollywood Boulevard looking for the handprints of your favourite movie stars. You may want to visit Griffith Observatory, perched high on a hill overlooking the city it is well worth a visit and is great for views of the legendary Hollywood sign. Enjoy your final day in Los Angeles. You may want to stay close to the coast sampling Santa Monica or Venice Beach which are both best explored by bike. Alternatively, head for the Hollywood Hills to visit one of the movie studios for a tour. Tonight, you may want to enjoy dinner in downtown Los Angeles as you take in the skyscraper scenery. Tomorrow you’ll fly home from LAX after spending the morning finishing off any sightseeing. Don't forget to check out this road trip's Itinerary tab to see more amazing pictures from our "Classic Highway 1" tour. You'll also be able to read a little bit about what you'll be getting up to on each day of this incredible road trip adventure.